Does Loomis require an interview? Does Loomis require standardized tests? 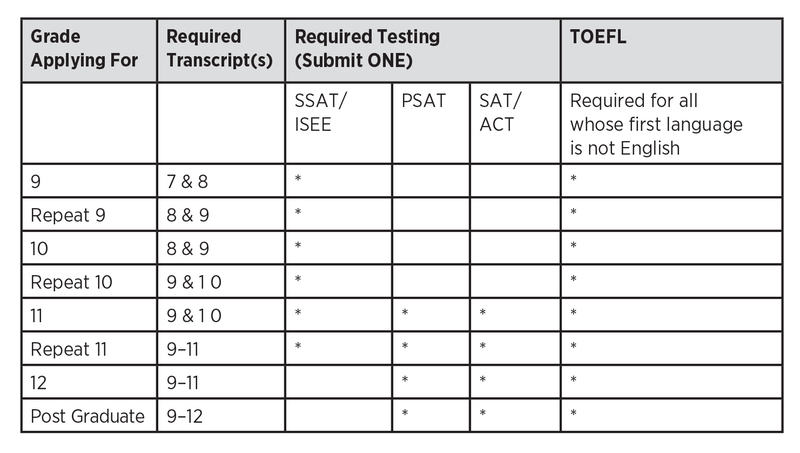 Does Loomis require a minimum TOEFL score for admission? Is there an application fee for international students? What is the financial aid process for international students? How many international students are at Loomis? What is life like at Loomis for international students? Does Loomis offer English as a Second Language courses? Who may I contact if I have questions about the admission process? Yes, an interview is required as part of the application process. Should you wish to schedule a campus visit, please make sure to contact our office well in advance of your planned travel. * In order to schedule a campus visit, please complete an Online Inquiry and follow up by contacting our office at admission@loomis.org. If you would like to request a web-based interview, please complete your application and once submitted we can arrange for an interview. For families in mainland China you may complete the interview requirement using Vericant. You may schedule an in person interview with Vericant by contacting them here. All international applicants must demonstrate proficiency in oral and written English. The TOEFL is required for candidates for whom English is not their first language. Most successful applicants score at least a 100 on the internet based (ibt) TOEFL. When submitting your SSAT score, please note that we only accept test scores directly from SSAT; we do not accept copies from your school or consultant. To prevent delays, be sure to list us as a score recipient when you register for your test. Loomis SSAT code is 4672. Loomis TOEFL code is 8137. Most successful applicants score at least a 100 on the internet based (ibt) TOEFL. We encourage international applicants to use the Gateway application if possible; a link to that application is available on the Apply page beginning August 21, 2018. If you are living in a foreign country other than Canada or Mexico, you must pay the $160 application fee. If you are living in Canada or Mexico, you must pay the $75 application fee. Please send a money order drawn from a US Bank. The admission application deadline is January 15 for all students. The financial aid deadline for all students is January 31. Yes, but on a limited basis. Please refer to the financial aid process for more information. Be sure to indicate on your Admission application, that you will be applying for financial aid. By January 31, complete a Parents Financial Statement (PFS) online. Be sure to retain your login and password information. After submitting your PFS, you will be given instructions about submitting additional documents. Please submit signed copies of the following documents directly to SSS. If you file a federal tax return, submit a signed copy of your 2017 and 2018 federal tax returns with all supporting schedules. If your 2018 tax return is not yet available, submit your 2017 tax return. You must submit your signed 2018 return as soon as it is completed. If you own your own business/farm you must include a business/farm statement which can be found on the SSS website with the PFS. Currently, Loomis enrolls 700 students. International students (non-U.S. citizens) make up approximately 15 percent of Loomis’ student body and come from more than 35 countries. Learn more about life at Loomis for international students. No, Loomis does not offer ESL courses. Yes, international applicants who gain admission to Loomis will be issued I-20s while they are a Loomis student. Visit the How to Apply page for complete instructions. If you have questions about the admission process, please contact Rock Battistoni, Associate Director of Admission.